It’s election time again in West Bengal. Perhaps it is apt to refer to elections as festivals. Irrespective of the material outcomes of the elections, people seem to come out and take part in this process. It has been observed how poor people, who are clearly victims of the system that they help keep running through their hard labor, come out on election day, with great energy and enthusiasm, often in their best clothes. They will eagerly stand in long queues to cast their vote, even if the sun is scorching down upon them. From researchers to political pundits, many have tried to dissect the mindset of the Indian voter, as to what exactly is the motivation to vote despite the fact that things in general don’t seem to change much in the long run. One popular hypothesis is that people feel empowered, even if they know that this participation in democracy is a token one. Regardless of the boisterous claims of the ruling party though, how many of us can really deny that no fundamental positive change has occurred in the lives of the vast majority of working class people? The “dance of democracy” meanwhile goes on in its own pace. One can see Trinamool Congress declaring through its wall graffiti that “From 8 to 80, all of us are fine”. CPM (along with its electoral ally Congress) is busy talking about the various kinds of scams that have rocked the state government, the latest two being the Narada sting operation which exposed the corruption of top leaders of TMC and the other one being the involvement of TMC backed syndicates in the Vivekananda Flyover collapse that claimed several lives and maimed many more. BJP on the other hand is busy with their own propaganda about “infiltrators” and “paribartan noi patan” (downfall, not change) against the incumbent government. But these are the “usual suspects”. What are the other forces, known variously as “left of CPM” or “third stream left” or “radical left” doing during this time? CPIML (Liberation) is obviously an openly parliamentary party, so they are naturally contesting elections. Members of their student organization AISA and youth wing RYA are campaigning ahead of the elections – their rhetoric is directed mostly against the TMC government as well as the BJP. Through this electoral campaign which even includes extremely problematic rhetoric like “Desh Bachao, Gonotantro Bachao” (Save the country, save democracy) they are only contributing to the illusion that there is a democracy to be saved in the first place. (Of course a counter argument is often provided at this point – that compared to some authoritarian regimes, there is relatively greater democracy in India – to that one can say that while that is perhaps true, why should a revolutionary organization set their yardsticks so low?). Yet another party, CPIML (Red Star) has also fielded its candidates. From the party’s program document itself, it would appear that it is possible to bring about massive changes in the production and distribution sphere through electoral gains. Even MKP or Mazdoor Kranti Parishad, is actually fielding organization members as independent candidates as they have done in the past as well. The student organization closely linked with them, PDSF, as well as the youth organization KNS, is also campaigning in favor of such candidates. But in other places, MKP or one of KNS’s magazines, Laali Guraas, is asking people to vote for “NOTA” (None of the Above). The general rhetoric of the organization is that the parliamentary system is flawed and it is through people’s movements alone that revolutionary change can come about. In fact, their claim is that during the election campaigns also they will be critiquing the parliamentary system. In a way that is true also – I have seen their election parcha in the past and in it they do say that no claim is being made that any real change can be brought about by a small electoral victory. But one can ask a very legitimate question at this juncture – couldn’t this campaigning of exposing the inherent limitations of the parliamentary/electoral process have been done without asking people to vote for their candidate? If they don’t think that any positive change can come about by such electoral wins, why even bother to ask people to vote for a candidate? Isn’t that only going to confuse people? The fact that they are asking people to vote “NOTA” in places where they don’t have candidates is only adding to the confusion instead of dispelling it. One cannot be blamed for interpreting that if they had candidates from other constituencies too, they would have asked people to vote for their candidates and not for “NOTA”. But this would mean that their very claim that they find parliamentary politics insufficient is questionable. Yet another organization Radical Socialist argues that because there is a fascistic force (the BJP-RSS-Sangh parivar) at the center, there is need for a broader left unity. This organization considers CPM to be problematic and says they haven’t forgotten their past ills (or overlooked their current opportunistic pairing up with Congress) but still they consider CPM to be a “working class organization” and therefore think that it would be prudent to have as many “left” MLAs as possible as that would be helpful to the cause of people’s movements. However, apart from the fact that CPM has the word “communist” in its party name, just what about its current practice or history gives one the impression that it is not a bourgeoisie party but a party of “working class” is not clear. Neither has the party (or its affiliated orgs like SFI, DYFI, CITU etc) offered even an apology for the numerous instances of anti working class actions epitomized by the injustices at Lalgarh, Nandigram, Singur, Marichjhapi or their policy of giving a red carpet to private capital in almost all sectors possible, nor has it stopped being a party composed of goons and lumpen cadres who are absolutely ideologically bankrupt. Ironically, it was CPM in West Bengal who ushered in the era of liberalization and FDI ahead of many other states not governed by “left”. CITU posters are found in some mohallas of closed down factories where they forget to mention how their party actually aided in the process of the deplorable condition of working class in the state. In fact, as another small group called Mazdoor Mukti has brought out in its parcha, even TMC has taken some “anti imperialist” stance – by its opposition to nuclear plants, FDI in retail and SEZ. However, IT companies and other capitalists have been given the green license to exploit the working class. The thousands of factories that remain closed show no sign of being reopened. The workers in tea gardens have to starve as tea gardens remain closed. It is really pointless to list the many kinds of exploitation based on class, caste, gender etc. that are going on under the current government, if only for the simple reason that the problems remain more or less the same with whichever party comes in power. This will indeed be the case because of the structural compulsions of the parliamentary system and its institutions. Thus all those parties which are asking people to vote for their candidates are only adding to the false impression that things can improve within the present structure or that only small incremental improvements here and there is the only way (forward?). On the other hand, even those groups/little magazines like Mazdoor Mukti or Chetana Lahar which have asked people to reject all (the former though, perplexingly, have not made a single mention of the “radical left” forces, thereby not making their stance clear about Liberation, MKP, Red Star etc.) the present parliamentary parties (and not quite the system itself) and instead vote for NOTA, are not really getting it right. First of all, if they do believe in the parliamentary system, clearly without the right to recall or other additional electoral reforms, NOTA is absolutely toothless. One can only know how many people have voted for NOTA. 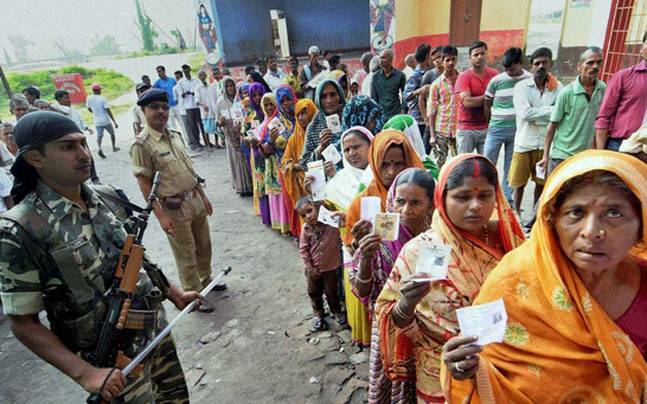 There is no way to know who have voted for NOTA, so it is not an organized effort at all. Not just NOTA, it also doesn’t mean much to ask people to “boycott” elections. Neither voting (whether for any party or for NOTA) or boycotting per se serves any purpose. There would be no way to know just why people have rejected the existing parties (whether by giving NOTA or by boycotting). It is quite possible, as I have seen from personal experience, that people are rejecting all existing parties because they don’t fit their hard right wing ideological position. So there is no reason to be elated about a certain number of people voting for NOTA or boycotting elections – it does not at all automatically mean that they are not Hinduists or staunchly pro-capitalists, let alone be ideologically socialistic. Ultimately, if people’s movements and struggles are the way forward, if building a socialistic camp is the only way towards an alternative, then it is better to instead work towards ensuring disillusionment about the parliamentary system. This entry was posted in Elections, Left and tagged bjp, congress, cpiml, cpm, electoral politics, liberation, trinamool, vote, west bengal elections on April 12, 2016 by kisholoy2017.